Sweep-All (48″) 9HP Honda Powered 42 Cubic Foot Professional Lawn Sweeper. Cleanup is important on any job-site, and Turf-master sweepers will make cleaning more productive – whether you are removing sand, stone or debris. Use the Turfmaster Sweep-All attachment to sweep material into the hopper – up to 20 times faster than sweeping by hand. 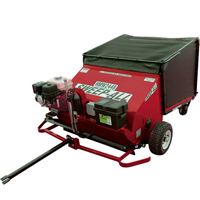 Sweep-All Gas Powered Tow Behind Professional Lawn Sweeper. It is great for large areas and cleaning up on your lawn care rout. 270cc Honda GX270 OHV Engine w/ Manual start: Excellent torque, fuel efficiency & easy starting. Flip/Dump System: Makes it extremely easy to empty the hopper, even when full. Push-Button Controls: Dial in the perfect engine speed, broom RPM & broom height. Tow-Behind Design: ideal for lawn tractors, ATV and UTVs.